This post is part one in a new series for ImpactSpace as a part of their inaugural 2015 fellowship. I will be writing about current issues in the impact field throughout the summer. Join the discussion by commenting here or on Twitter, @hongkonghaiti. Update: recent reports have found that once-promising SIBs have failed to deliver results. Read “The Prison Reform #Fail That is Shaking the Social-Impact Bond Market” on ImpactSpace. Soaring prison populations, rising inequality and ballooning costs have come to define the American justice system. The problems have become so severe that the issue receives broad bipartisan support in the notoriously deadlocked U.S. Congress. Last week, a new bill called the Safe, Accountable, Fair, Effective (SAFE) Justice Act was introduced in the House of Representatives with support from the NAACP, the Police Foundation and the American Conservative Union. With justice reform becoming increasingly popular, some U.S. states have already taken matters into their own hands. Social impact bonds, which successfully brought down recidivism rates in the UK, are now the “hottest” tool available to states looking for results. The U.S. has 5% of the world’s population and 25% of the world’s prison population. The Department of Corrections costs the U.S. over $80 billion dollars annually and rarely are people truly “corrected.” Instead, the Bureau of Justice Statistics finds that over half of prisoners are arrested by the end of the first year and more than three quarters of prisoners are rearrested within five years of release. In addition to the $80 billion annual price tag, indirect costs add up. As prison sentences increase and prisoners age, work years are lost. Jail reduces the work time of young people 25-30% compared to youth who are never incarcerated. Why Social Impact Bonds (SIBs)? Forbes has a useful diagram to understand the process: If the target outcome is not reached, then the investors assume the costs and the government is no longer in debt. If outcome is reached, then investors’ return is paid by the government. Can SIBs End Mass Incarceration? SIBs have been tackling recidivism since the first bond issued by the British Ministry of Justice and executed by Social Finance. Since then, new SIBs to reduce recidivism have been launched in Israel, the United Kingdom, and the U.S. The structures of the bonds vary. The Rikers Island SIB payment schedule, for example, scales investor returns according to the amount that recidivism is reduced. 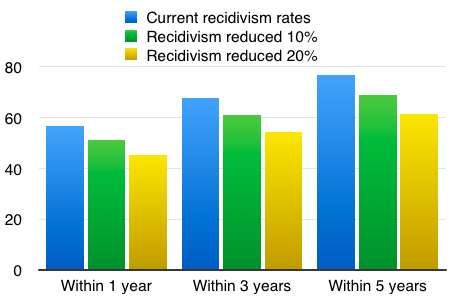 A recidivism reduction of 12% yields 5% returns while a 17% reduction yields14% returns. In the U.S., a 10% reduction in the current recidivism rate would translate to approximately 15% of current prisoners not being jailed within five years of their release. As the new SAFE Justice Act shows, the end goal is widely agreed upon. The challenge of how to do this is the question. In addition to legislation and policy, SIBs offer one model to reward results from preventive and rehabilitative programs to cut recidivism rates and the U.S.’s high prison population. SIBs are not the only answer to this problem, but they’re a promising new way to incentivize investors, the government and program providers to make progress on the issue together. The verdict on SIBs is still out. What do you think? We want you to weigh in! Comment here, join us on Twitter, and let us know your thoughts on social impact bonds, criminal justice reform, and other impact trends on the rise. Check back here for a new post about big news in the impact world. Report: Bringing Social Impact Bonds to the U.S.